Everyone who has been to the dentist has had dental x-rays at some point, whether as part of their routine visit or to help diagnose a problem. So, what exactly are dental x-rays for and why are they such an important preventative and diagnostic tool for the dental professional? There are many different types of dental x-rays and they all have different purposes. These are the most commonly used dental x-rays and the information that they provide your dentist. Dental x-rays are taken with you sitting upright in a chair. The dental technician will place a lead apron over your chest and wrap a thyroid collar around your neck. The x-ray sensor or film will be placed in your mouth for the picture. Most patients do not have any problems or discomfort when taking x-rays. The size and location of the sensor placement are a big factor in how comfortable or uncomfortable you will be. The size of your mouth is also a factor because if you have a small mouth, it makes placing the sensor a little more challenging. Taking x-rays should never be painful, just awkward or uncomfortable at the most. If you happen to have a sensitive gag reflex, you may want to let your dental technician know ahead of time. There are things they can do to help keep the gag reflex at bay while taking the x-ray. Children are especially prone to gag reflexes and have a hard time with dental x-rays. Bitewings are typically taken every year (or as recommended by your dentist) to help detect dental caries between your teeth as well as to check the bone level that houses your teeth. Often referred to as PA's, this type of x-ray takes a full tooth picture from the very top of the tooth (crown) to the very tip of the root. Periapical x-rays are usually taken when you are having symptoms with a specific tooth or as a follow-up to a procedure. Your dentist can help determine if there is an abscess, abnormalities in the surrounding bone structure, or deep decay. These specialized x-rays are not as routinely used as the others but can provide very valuable information. They are typically used to show the roof or floor of the mouth and to check for things like extra teeth, impacted teeth, abnormalities, issues with the jaw, and any solid growths, such as tumors. A panorex x-ray is taken every 3-5 years (or whatever is recommended by your dentist) but can also be taken by your orthodontist in preparation for braces and by an oral surgeon in preparation for surgery, such as extracting your wisdom teeth. Digital x-rays are starting to replace traditional plain film x-rays due to the ease of use, efficiency, and most importantly, the reduced amount of radiation needed and used. Digital x-rays are taken with a specialized sensor that sends the image directly to the computer, where it can be viewed immediately. With a plain film x-ray, if the image comes out too light or too dark, it would need to be retaken. With a digital x-ray, you can adjust the x-ray on the computer to allow for easier reading. 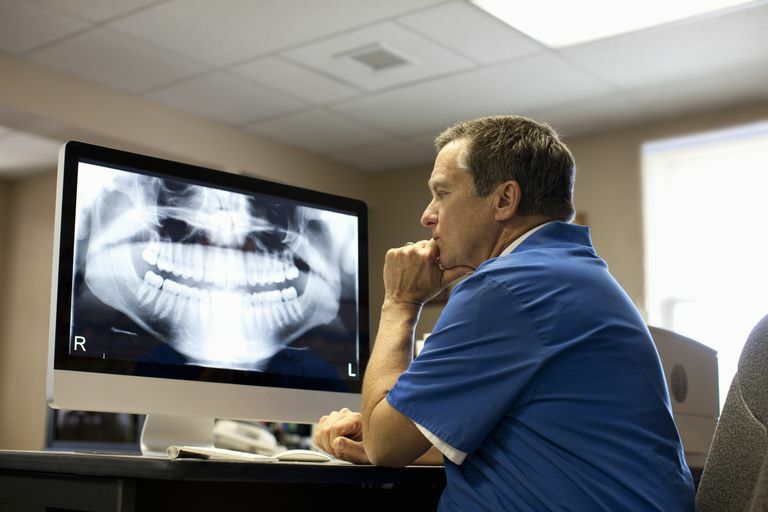 The dentist can also zoom in on specific areas of the x-ray and even create a larger image. There are guidelines and regulations put in place in order to keep the radiation exposure to a minimum. States often have very strict protocols in place, as well as inspections to protect the public's safety. And while we all should try to limit our exposure, dental x-ray equipment (if used properly and the technicians are following all of the guidelines recommended) is fairly safe and uses very little radiation. Both dentists and obstetricians say it is not recommended that you have any dental x-rays taken while pregnant unless it is absolutely necessary. The American Pregnancy Association states that although the amount of radiation you receive from a single x-ray is not enough to pose a real threat to a developing fetus, they highly recommend you put off any x-rays and other dental work until after the baby is born. Most dental insurance plans cover routine dental x-rays along with your routine dental exam. Every dental plan is different, though, so you should check with your insurance provider and/or HR representative for details on your specific plan. The U.S. Food and Drug Administration has set the following guidelines regarding the administering of dental x-rays during a routine dental visit. For a child with no clinical decay and no risk of decay, posterior bitewings are recommended every 1-2 years. An adult with no obvious clinical decay and no increased risk should receive posterior bitewings every 2-3 years. For a child with evident clinical decay or at an increased risk of dental decay, posterior bitewings are recommended every 6-12 months. Adults who have an increased risk of tooth decay, obvious clinical decay, generalized dental disease, or a history of extensive dental treatment should have posterior bitewings taken every 6-18 months. American Pregnancy Association, "Dental Work During Pregnancy." U.S. Food and Drug Administration Chart: Guidelines for Prescribing Dental Radiographs. Can Xylitol Toothpaste Improve Your Dental Health?